While some technologies progress incrementally, providing a steady increase in performance, others do so in leaps, bringing massive improvements once every few years. The latter is the case when it comes to storage and RAM. Samsung, being the leader in memory module manufacturing, showed us when we can expect the next "leap", when it comes to smartphones. This happened at an event in Hong Kong, hosted by Qualcomm and focused on 4G and the upcoming 5G. During a presentation by Samsung’s head of mobile memory product planning, it was revealed that the next generation of flash storage, called UFS 3.0, is coming to mobile devices in 2019. If you want to learn more about UFS and the current standard used, UFS 2.1, you can check our article that explains what that’s all about. In short, UFS is the type of storage that modern smartphones use for everything from the operating system to photos and videos. Every memory chip has a maximum speed at which it can read and write files, higher speeds make your device feel snappier and more responsive. 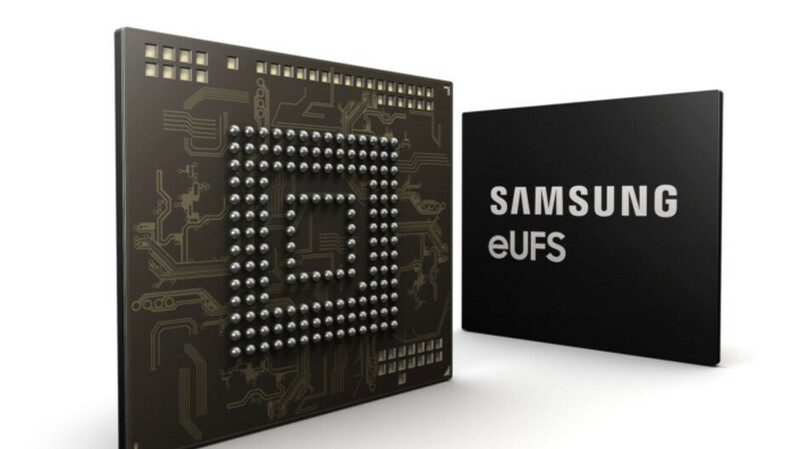 UFS 3.0 chips will be manufactured using Samsung’s latest 3D NAND technologies and will allow the company to not only cram more storage into the same size, but also make them two times faster. The first wave of the new chips will come in three variants: 128GB, 256GB and 512GB, with 1TB option expected in 2021. This means that we’ll soon say goodbye to flagship phones with 64GB of storage, as we should have a long time ago. On the other hand, that might be used as another reason for manufacturers to hike up the prices. Either way, the new chips are not only coming to shed a few milliseconds here and there but are considered a necessity with the introduction of 5G and ultra-high-definition (and high FPS) video recording and playback. Another major advancement is coming in 2020 in the form of LPDDR5 RAM. Samsung’s DDR5 memory will have a significantly improved maximum bandwidth: 51.2GB/s (currently around 25GB/s), while at the same time being 20% more power efficient. RAM is also very important for the performance of your handheld device, since that’s where it stores the apps you’re currently using, among other things needed for its operation. The switch to LPDDR5 will be the first major memory upgrade phones will see since the introduction of LPDD4 in 2014. Needless to say, those components can’t come fast enough, but it appears we’ll have to wait at least a few months before we get our hands on a UFS 3.0 phone and even more before we can experience the faster memory. Apple is trying its best. They will still have 5w in the box by 2020. They're kind enough to include charger in the box. I can't wait for LPDDR5 ram. The thing is LPDDR4 ram brought lower voltage at 1.1 volts. But LPDDR4X ram lowered the voltage again to 0.6 volts. Plus the fastest clock rate was 1866 MHz. So let's hope they will bring faster than 2133 MHz, like 2400 MHz, 2666 MHz, and some go up to 3200 MHz speeds. There is even a crazy 4600 MHz speed. It will be interesting to see what comes next. But the real upgrade has to come from SoC manufacturers. They also have to get lower voltage ratings. I hope some OEMs will add the ram and storage on board the SoCs themselves. Now that would be awesome. Everything on a single chip. I remember when GPUs, memory controllers, and other things were all separate chips. It pretty good now, but they still have a ways to go. I don’t bring my charger when I go to work. My iphone Xs Max lasts a day. In fact, I got 40% when I got home. If you need to bring your charger at every place you go then you need to lessen yourself on using phone by finding LIFE, as in time where your face doesn’t stick on a phone. Yeah but if you work involves you needing a mobile phone then you don't have a choice do you? Some of us need a phone to do our jobs. Faster RAM, true bezeless displays with sensors beneath screens and graphene batteries. This is why Samsung are important in the industry without them we be years behind. Truly an innovative company. Yet provides phones with outdated QC 2.0 standards in age of other brands doing as much as 50watts that does 0-100% in 35 minutes. Only brand giving a tough competition to Samsung as of now is Apple with it's 5 Watt chargers. Its fine I have a Note 9 with a 9 Watt charger and it charges my phone within 2 hours and thats the slow charge if i enable with fast charge 1 hour 40 mins. That said thank god I have a 4000mah battery because it lasts me 2-3 days on 1 charge. Which phone does 0-100 in 35 mins because it isnt the Mate 20 pro https://www.youtube.com/watch?v=HztMkTvLDsw I forgot 1 bad point makes the whole phone useless right? A phone consists of multiple parts, I dont mind a slightly slower charger when I have amazing battery life, sd card slot, headphone jack, amazing display, good solid cameras. Though iphone has 5w chargers, iphone is the best selling phone. A 5 year sold Notes is just one day for iphone Xs Max. Really looking forward to a graphene battery by next year and all screen display! Come on NOTE 10!!!!! Yeah no doubt Apple will be the first ones to cross that $2000 mile stone but it will take them a few more years to reach that goal. All my friends have went and Buy Huawei Mate 2 pro. 980 Kirin ( 4200 mAh battery and fast Charging. Nobody will waits for Samsung Galaxy S10 or future Samsung Phones That company Never presents. Goodbye With your Cheap marketing Propaganda. We are living in the present, not in the future. When you will release this phones with this specs, the other manufacturers will have again better specs than you in their smartphones. So Get lost. death to the micro sd card!!!!! Samsung Has Hole in the brain.If consumers wanted to buy brain with holes, Samsung will was the best selling product in the planet.